It may have only lasted two years, max, but punk infected everything around it. Forever. The handbags and the gladrags that littered the 70s charts were ripped to shreds when that dismal decade – doomed to failure in the wake of the supersonic 60s – skipped a few beats halfway through, dancing to that illicit punk beat at the pogo-a-gogo before limping into the unimaginatively named ‘post punk’ era with atrial fibrillation and a pulled hamstring. Post punk was still punk, but it was punk in disguise. When dressed in lethal black it became goth; sharp grey – ska; cool blue – electro, and fiery red with a hint of yellow and a kilt – new romantic. Instead of one headline grabbing movement backed by an army of serious come hither words, there were several, less severe but infinitely more tuneful. Pop music became glamorous again – not in a tacky, early seventies tin foil kinda way – but with style and panache and a sprinkling of despair. And that’s the best kind. Flexipop! may have lacked the style and panache but it did have lashings of despair. Crucially, it was fun despair, the kind that doesn’t stick or stain. Disposable despair. The monthly magazine, published totally independently by ex-Record Mirror writers Barry Cain and Tim Lott, first appeared on 30th October 1980. During the month the first issue of Flexipop! was on the newsstands, six Provisional Irish Republican Army prisoners in Maze prison went on hunger strike; the Polishgovernment recognized Solidarity; Ronald Reagan defeated Jimmy Carter to become the new U.S. president; the NASA space probe Voyager I flew within 77,000 miles of Saturn; The Gang of Four trial began in China, and a world record number of TV viewers finally found out who shot J. R.
It was an odd world with odd charts. 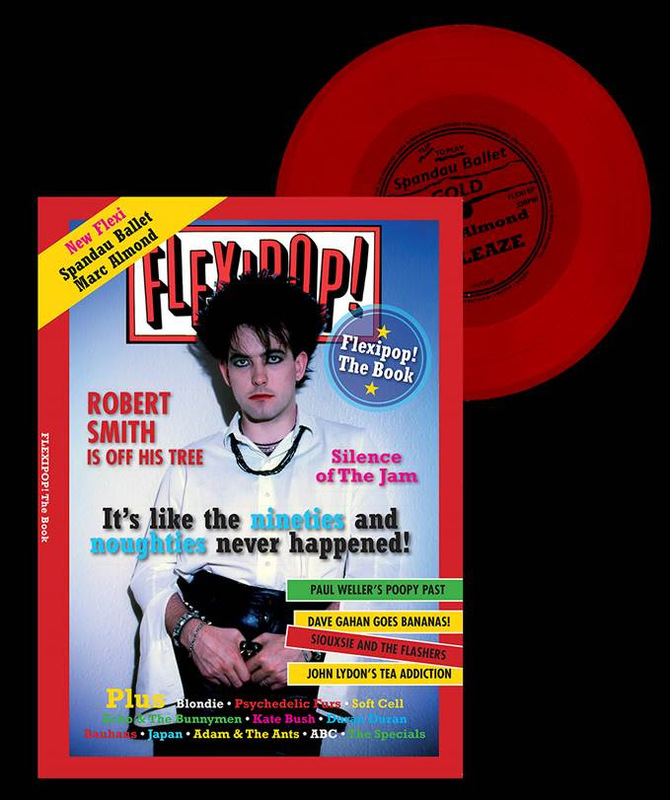 There was an exclusive gaily coloured flexi disc on the cover of each issue of Flexipop! made of ultra-thin vinyl but eminently playable. The big acts of the day saw potential in the idea and provided us with unreleased tracks free of charge. The records were pressed at a factory off the Holloway Road before being attached to the magazine and shipped off to W. H. Smith and Menzies – sometimes 150,000 copies at a time. Pop mags used to sell a bit back then. The likes of the Jam, Blondie, Madness, the Cure, Depeche Mode, Soft Cell, the Pretenders, Thin Lizzy, Motorhead, Bow Wow Wow, even Genesis, did flexis and the magazine was a runaway success. The biggest seller was the issue with the Adam & The Ants flexi ‘A.N.T.S.’ sung to the tune of Y.M.C.A. – Radio 1 played it to death. Paul Weller even wrote and performed a slice of psychedelia – ‘Pop-Art Poem’ – just for Flexipop!. Flexipop! was a strange concoction of dark humour, cynicism and cute stories with cute pix. Timeless features like Testament Of Youth and Welcome To The Working Week revealed hugely intimate details about the lives of a host of stars from Kate Bush to Kim Wilde via Johnny Rotten and Marc Almond. Flexipop! photo stories sometimes approached dodgy graphic novel territory. But it didn’t stop the likes of Depeche Mode, the Damned, the Stranglers and XTC from starring in them. Flexipop! cartoons were, frankly, grotesque but incredibly funny. They were the deranged work of the magazine designer Mark Manning who went on to become Zodiac Mindwarp. The public wants what the public gets and everything ran smoothly. Then disaster struck. One photo story based on Mad Max with psychobilly band The Meteors was too graphic thanks to a shitload of offal from a local butcher in Kings Cross and some very realistic special effects. The magazine continued to come out but the orders fell substantially without the backing of Smiths (those charming men) and by the time the mag was back on their shelves, it was too little too late and nine months later Flexipop! was no more. The final issue, on 28 July 1983, featured the infamous dark lord of wizardry Aleister Crowley on the cover and was numbered 666.